Want to connect to a distant wifi network, and rebroadcast it throughout your home, boat, or RV? This is the kit you need. Setup is quick, performance is top of the line. The WiJacker USB Wifi Router Repeater, combined with our most powerful USB Antenna, the WaveRV Marine XL, is what you've been looking for! It is quick and easy to connect the kit to a public wifi network, transforming it into your own private hotspot! This kit includdes everything you need. You'll be up and running in no time! The USB Router Repeater is made from durable CNC aluminum. It's nearly bulletproof!. Setup is a breeze--you'll be done in minutes! 12V operation for connection to standard power adapter, or any 12 volt mobile outlet. your own personal wifi network! 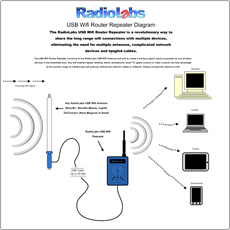 RadioLabs is thrilled to offer a simple and powerful kit to repeat any WiFi signal. The 5' Marine XL Antenna connects to a far-off hotspot or wifi network, and the USB Repeater broadcasts the signal under your own private network name. Setup is a breeze. There's nothing else out there that is as easy and works as well as this kit. 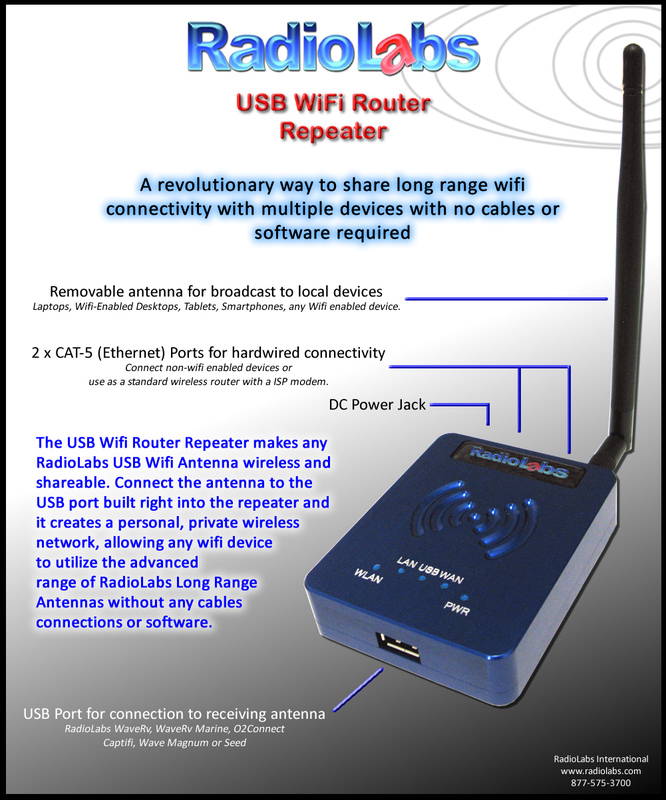 Interested in taking the performance of our USB WiFi Router Repeater to the next level? This is the kit for you. The WaveRV Marine XL is, simply put, one of the best omnidirectional antennas out there, and pairing it with our USB WiFi Router Repeater allows you to enjoy a localized WiFi network for connecting all your devices to a far-off hotspot. Plug in the WaveRV Marine XL antenna to the USB Repeater. After logging into the Repeater, locate and connect to the desired public or private WiFi signal. Change the SSID of your new personal Access Point ex: "Eddy's House"
Connect all your devices to the new network and enjoy surfing immediately! The USB Router Repeater is designed to receive far-off wifi signals through its USB antenna, it then broadcasts its own wireless network. This means that your tablets, smart phones, and basically any wireless device can connect to that faraway wireless signal without needing a powerful antenna for each device. The WaveRV Marine XL is one of our best antennas. It is designed for marine use, and is able to stand up to the most severe weather conditions out there. At ranges of over 1 mile, the WaveRV Marine XL performs better than virtually any other wireless card/antenna combo out there. All it takes to setup the USB Router Repeater is a computer with most any standard web browser (Safari does not work, but Firefox or Chrome on a Mac works great). The configuration tool is easy to use, and within seconds you can configure your Repeater hook up to a new access point and begin broadcasting your private network..
WaveRV Antenna: 3.1 Watts (35dBm). Dimensions Repeater: 3.5" x 3" x .75"
Antenna: 52" x 1.4" x 2"